The Anne Frank Center has demanded US press secretary Sean Spicer be fired after he claimed Adolf Hitler “didn’t even sink to using chemical weapons” in a comment overlooking Nazi Germany’s use of gas chambers during World War II. In the midst of Genocide Awareness Month, the White House spokesperson appeared to skip over major facts about the Holocaust. Asked during a briefing on Tuesday about the relationship between Russia and Syria, Spicer brought Hitler and his apparent ‘lack’ of chemical weapons use into the equation. “We didn’t use chemical weapons in World War II. You had someone as despicable as Hitler, who didn’t even sink to using chemical weapons. So you have to if you are Russia, ask yourself is this a country and a regime that you want to align yourself with,” he said. Spicer then sought to clarify the Hitler remark in a rambling, sometimes incoherent, answer to the press: “I think that when you come to sarin gas, he was not using the gas on his own people the same way that Assad is doing. Sean Spicer put more than a foot in his mouth when he said "Not even Hitler gassed his own people." With around six million exceptions! The incredible glossing over of Hitler’s systematic murder of 6 million Jewish people during World War II prompted the Anne Frank Center to demand Spicer’s dismissal. 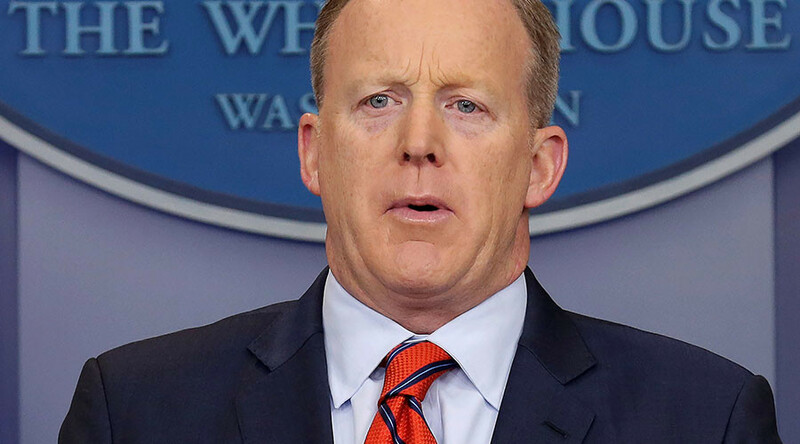 “On Passover no less, Sean Spicer has engaged in Holocaust denial, the most offensive form of fake news imaginable, by denying Hitler gassed millions of Jews to death,” Steven Goldstein, Executive director of the center, said in a statement. April is Genocide Awareness and Prevention month and given the importance of his role in the White House, Spicer is now being roundly chastised for his lack of basic historical knowledge. Mexico’s former president Vicente Fox Quesada even had a go. Sean Spicer, you cannot lessen the horrors of war by comparing the dreadful deeds of false leaders … you're truly @realDonaldTrump's voice. Meanwhile other Twitter users suggested that United Airlines and Pepsi must be thankful for Spicer’s own PR disaster. The White House later released a follow-up statement from Spicer, with the press secretary offering a further explanation for his remarks.